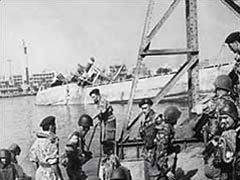 This page deals with the Suez War of 1956. Please use the following information, links and sources to learn more about the Anglo-French attack on the Suez Canal and the Israeli seizure of Egypt's Sinai Peninsula. In 1956, three of the Twentieth Century's most dominant forces came together in a short, violent clash in the Egyptian regions known as the Suez Canal and the Sinai Peninsula. These three forces, (or, to use a literary term, themes), were: Nationalism, the Cold War and the Arab-Israeli conflict. Egypt and other Arab nations had recently gained full independence from the empires controlled by European powers such as Great Britain and France. These young nations with ancient cultures and histories strove to gain economic and military sufficiency while asserting their political rights as free peoples. The Cold War struggle between the mostly democratic and capitalist West against the Communist East dominated by the Soviet Union and China both helped and hindered the Nationalist goals of many African and Asian countries. For example, Egypt sought foreign aid in building the Aswan Dam project which would control the wild Nile River. The United States and Britain, major players in the West, declined to help Egypt because of her political and military ties to the Soviet Union. The Soviets eagerly rushed in to aid Egypt. After this, Egypt came to be considered a friend of the Soviets, and a nation not overly friendly to the West. In this way, the Cold War affected the young nation of Egypt and her relations with the rest of the world. The Arab-Israeli conflict began in 1948 and caused Egypt and Israel to be bitter foes until 1979. The second war between these Middle East neighbors took place in 1956. As part of Egyptian President Nasser's nationalist agenda, he took control of the Suez Canal zone away from the British and French companies which owned it. At the same time, as part of his ongoing struggle with Israel, Egyptian forces blocked the Straits of Tiran, the narrow waterway that is Israel's only outlet to the Red Sea. Israel and Egypt had clashed repeatedly since their 1948 war as Egypt allowed and encouraged groups of Palestinian fighters to attack Israel from Egyptian territory. In response, Israeli forces constantly made cross-border raids in retaliation. Britain and France, both of whom were in the process of losing their centuries-old empires, decided on a strategy straight out of their 19th Century Imperial histories. This plan led to a joint invasion and occupation of the Suez Canal zone by Britain and France. This was meant to reassert control of this vital waterway to the British and French companies stung by Nasser's bold nationalization. At France's suggestion, planning was coordinated with Israel, a fact which all three nations denied for years afterwards. On October 29, 1956, Israeli troops invaded Egypt's Sinai Peninsula and quickly overcame opposition as they raced for Suez. The next day, Britain and France, following their part of the script, offered to temporarily occupy the Canal Zone and suggested a 10 mile buffer on either side which would separate the Egyptian forces from the Israelis. Nasser of course refused, and on October 31, Egypt was attacked and invaded by the military forces of Britain and France. In response to these developments, the Soviet Union, which at the time was ruthlessly suppressing an anti-Communist uprising in Hungary, threatened to intervene on Egypt's behalf. President Eisenhower of the United States pressured Britain, France and Israel into agreeing to a cease-fire and eventual withdrawal from Egypt. The United States, caught by surprise by the dual invasions, was more concerned with the Soviet war in Hungary and the Cold War than with Britain and France's dealings involving Suez. The last thing President Eisenhower wanted was a wider war over Suez. The war itself lasted for only a week, and invading forces were withdrawn within the month. As a result, Egypt now firmly aligned herself with the Soviet Union, which armed Egypt and other Arab nations for the continuing struggle against Israel. Map of the Sinai Peninsula and the Suez Canal region during the 1956 war. Israeli Commander Moshe Dayan in the Suez Canal region during the 1956 war. Arab-Israeli Conflict--The Hutchison Encyclopedia article on the Arab-Israeli Wars. American Reaction to the Suez War--Places the Suez Crisis and War within the proper context of world affairs at the time and explains America's reactions. Suez 1956--Very good essay on the Suez Crisis written by University of San Diego student Chris Leininger. The Suez War of 1956 : Table of Contents-- Part of the Jewish Student Online Research Center (JSOURCE). Suez Canal War (1956)--A web page on French aviation details some of the French units involved in the war. 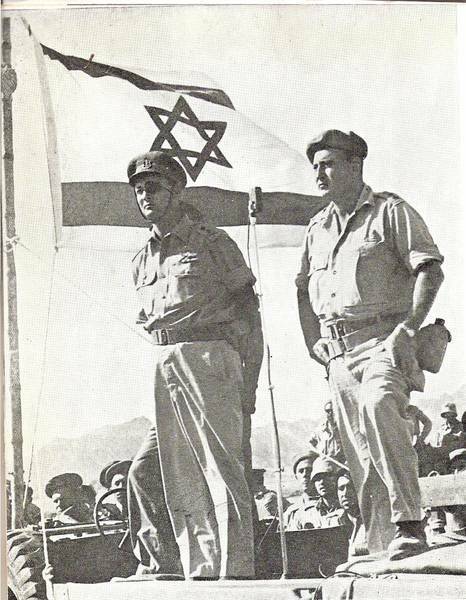 1956 Sinai Campaign--Article on the Anti-Defamation League website. Speech by Nasser: Sept. 15, 1956--Nasser's speech on the Suez Canal and negotiations with Britain and France. Phillips, Charles, and Alan Axelrod.Encyclopedia of Wars. 1st ed. New York: Facts on File, 2004. Marshall, S.L.A.Sinai Victory: Command Decisions in History's Shortest War: Israel's Hundred-Hour Conquest of Egypt. Morrow, New York, 1958. Herzog, Chaim.The Arab-Israeli Wars: War and Peace in the Middle East from the War of Independence through Lebanon. Vintage Books, New York, 1982. Barker, A.J.Arab-Israeli Wars. Hippocrene Books, New York, 1980.